This wide-field view shows the very rich star fields of the Large Sagittarius Star Cloud and the cluster NGC 6520 and the neighbouring dark cloud Barnard 86. It was created from images from the Digitized Sky Survey 2. A dark gecko-shaped nebula nests among millions of stars about 6,000 light-years from the sun in an incredible new image from a telescope in Chile. The photo, released today (Feb. 13) by the European Southern Observatory, shows the dark cloud set against millions of stars in a part of the Sagittarius constellation. 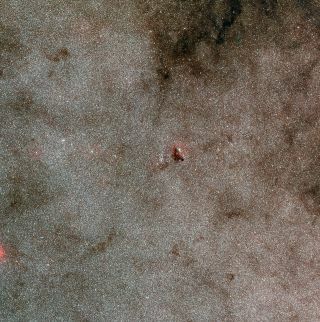 This area of the Milky Way galaxy — known as the Large Sagittarius Star Cloud — is one of the most star-dense areas in the galaxy, ESO officials said. One of the most striking aspects of the photo, however, is the seemingly starless, dark nebula called Barnard 86 tucked amid the dazzling backdrop of stars. "Through a small telescope Barnard 86 looks like a dearth of stars, or a window onto a patch of distant, clearer sky," ESO officials explained in an image description. "However, this object is actually in the foreground of the star field — a cold, dark, dense cloud made up of small dust grains that block starlight and make the region appear opaque." The dark nebula Barnard 86 (right) and the star cluster NGC 6520 (left) make a beautiful cosmic pairing. The cloud is most likely composed of material left over after the formation of the NGC 6520 star cluster just off to its left, scientists said. NGC 6520 contains a multitude of young, bright blue glowing stars that all probably formed around the same time, but it's difficult to understand the exact age of the stars in the cluster, ESO scientists added. Because so many stars are located in this part of the Large Sagittarius Star Cloud, isolating and observing the star cluster is difficult. Barnard 86 might still be producing new stars. Some dark nebulas create stars, but experts cannot tell if Barnard 86 is still a productive cloud. The photo was taken by a 7.2 foot (2.2 meters) telescope at ESO's La Silla Observatory in Chile. The imager used to capture the picture observed an area of the sky equivalent to the size of the full moon, Richard Hook, a spokesperson with ESO told SPACE.com.